More people are choosing to live in vacation destinations. World-class tennis and golf might be what drew many Palmetto Dunes property owners to their first vacation on Hilton Head Island in South Carolina. However, the reasons they chose a more permanent presence in the gated beach-front community are as varied as the personalities of these year-round residents. Gene and Jackie Wilhoit purchased a third-row beach home in Palmetto Dunes 19 years ago, planning to live there a while and "make the march toward the ocean," selling and buying subsequent properties, each time moving a little closer to the Atlantic shore. Two children later, the Wilhoits are still in their four-bedroom, four-and-a-half-bath home on Mooring Buoy, and they couldn't be happier. In 2004, they completely renovated the 3,800-square-foot house, making it truly theirs. They originally planned to redo only two bathrooms and the kitchen, but, nine months later, they found themselves in an entirely new home, Wilhoit says. "It fits us," he comments. "This is definitely our house." Some of the changes included making the downstairs bedroom into a home office and turning one of the upstairs bedrooms into a loft-like apartment where the Wilhoits' teenagers can hang out with their friends. For their next project, they will redo the back yard, landscape and install an in-ground pool. Palmetto Dunes, a residential resort community set on nearly 2,000 acres, is a mix of rental homes and villas, second homes and approximately 400 full-time residents, according to Robert W. Sharp, general manager of the Palmetto Dunes Property Owners Association. Homes sell for anywhere from $350,000 to $7 million, depending on their size and proximity to the ocean. Villas and single-family homes are located in two residential areas-Inverness and Mariners-and two villa complexes situated along the main corridor-St. Andrews and Queen's Grant-are home to full-time residents. The community also features commercial development: the Palmetto Dunes General Store, a 520-room Marriott Hotel, Alexander's Restaurant, Palmetto Dunes Outfitters, Palmetto Dunes Tennis Center and the Robert Trent Jones Ocean-front Golf Course. 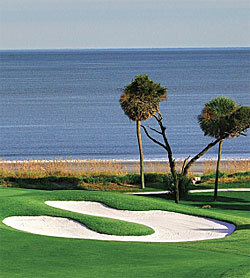 Located behind the South Gate in the Inverness section are the George Fazio Golf Course and the Palmetto Dunes Club. Leamington, comprised of 510 villas and 342 homes, none of them short-term rentals, is a separate community within Palmetto Dunes and has its own property owners association. The Palmetto Dunes Property Owners Association works closely with its board and committees to provide security for the community. Although many of its homes are rentals and villas, the people who call Palmetto Dunes home year-round have established a true sense of community. Philip A. Schembra and his family have lived in Palmetto Dunes for more than three decades. "The one common thread we share is family," he comments. Schembra, a realtor who specializes in Palmetto Dunes properties, points out that there is never a lack of things to do. "It's the best of both worlds. It's like being on a perpetual vacation," says Schembra. Ron Burhans, broker-in-charge at Ron Burhans and Associates, concurs, saying that "Palmetto Dunes is a world-class resort." Everyone's heard of Hilton Head," says Burhans. "I've been all around the world, traveled in Europe, and when I tell people I'm from Hilton Head and Palmetto Dunes, they know exactly where I mean. People strive to come here." "Palmetto Dunes' design is based on what other resort communities, like Sea Pines, did right and what they could change if they were able to do it all over again," Schembra says. "We have it all-the ocean, lagoons, the harbor, hotels, golf, tennis, shopping and restaurants." With so many activities available within Palmetto Dunes, it's hard to imagine why one would venture outside its gates. Outdoor pleasures include three miles of pristine beaches within walking distance, bike paths that weave through Spanish-moss-covered live oaks, lakes and lagoons abundant with wildlife, and kayaking, canoeing, boating and fishing on an 11-mile interconnected lagoon system. Palmetto Dunes Club is the gathering place where you'll find neighbors engaging in scheduled activities almost every day. The Club, which is independent of the resort, is open to all residents who wish to become members. Club activities include cocktail social hours, bridge, game night, golf, tennis, special dinners, holiday celebrations and private parties. All three Palmetto Dunes golf courses offer scenic views and the challenge of crossing or avoiding several lagoons. The Robert Trent Jones course is located on the north side of the community, while the George Fazio course, designed in the 1970s, is considered long and challenging and hosts an array of tournaments. A historic lighthouse sits on the Arthur Hills course, located on the south end of the community near Leamington. The Palmetto Dunes Tennis Center for years has been ranked among the top 50 U.S. tennis resorts by Tennis magazine. It consists of 23 clay and two hard courts, eight of which are lighted. Activities and services include instruction by certified professionals, adult and junior clinics, round robins, a pro shop and a game-matching service. The Dunes House and convention facilities offer residents a venue for large and small gatherings. Property owners may opt to use the services of the catering staff or prepare their own food and use the center's cooking facilities. Palmetto Dunes residents enjoy a swimming pool located near the Robert Trent Jones clubhouse. Open daily, the pool also is available for private functions. Leisure trails for jogging, biking and walking and spectacular views of wildlife and the environment wind through the community. There are several points of entry to the beach and ample parking. Beach access for the handicapped is available at nearby Islanders Beach Park, which is open to island residents and property owners only. A beach pass must be purchased and renewed annually through the town of Hilton Head Island. 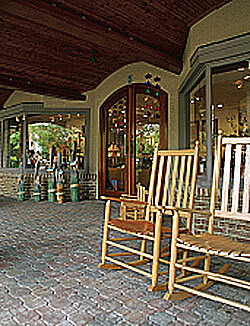 A gated community, Palmetto Dunes is monitored by security officers 24 hours a day. In addition, the Security Department offers house checks for owners who are away and will respond to calls regarding noise, complaints about animals or suspicious activity. Centrally located mid-island, Palmetto Dunes offers easy access to great dining and shopping, a marina, the theater and other cultural and arts activities. Wilhoit says he and his family appreciate the community's ideal location. "We probably eat out more than we should," he says, adding that they also take advantage of the Dunes Buggy, a shuttle that provides service throughout the island. "It's a great way to get around," he says.